Excuse me for enjoying a wee bit of gloating (when you follow Partick Thistle you have got to take the chance when it comes along) but was that past football season not just a thing of beauty? After almost a decade out of the SPL, Partick Thistle return next season after clinching the First Division crown with a couple of games to spare. It has been well covered elsewhere that the young squad of players clearly bonded as a unit, feeling that the media had already awarded the title to Morton. The Greenock team were in pole position for a long time. Although Thistle had games in hand, Morton's 8 point lead and their self-professed "experience", combined with Dundee United pinching our managerial team mid-season had sealed our fate in the eyes of many. This was turned into a positive motivating factor within the team as the players' "Kids vs Experience #WeGotThis" T-shirts demonstrated last Saturday at Falkirk. The young players have always been pretty active on twitter and Aaron Sinclair and others calmed my nerves with their obvious self-belief, starting to use the hashtag #WeGotThis as the season ground on. Just as important was the B-side of the T-shirts that they wore, the oft repeated cry from the crowd of "Archie's Army". Already involved in coaching at Firhill, the defender and club captain stepped up temporarily as manager. The players and fans made clear their belief that the post should be made permanent. His winning record and transformation of our away form made this inevitable. Alan "Archie" Archibald gets Thistle, the fans and players back him and we are happy to declare ourselves members of Archie's Army. He made his professional debut as a Thistle player in 1997 and played a season in the Premier League for us before moving to Dundee United for four seasons. He returned to Thistle as a player in 2006/7 and had a testimonial season a couple of years back (but is still only 35). One of my favourite Thistle memories is sitting behind the goal at Starks Park watching him frustrate Raith Rovers' Nacho Novo so much that when he lost the plot with him, Novo's red card was inevitable. A smart move was bringing in Scott Paterson as his assistant, whose famous goal against Inverness took Thistle to the Scottish Cup semi in 2002. He is another Thistle man, like Craig Hinchcliffe the goalkeeping coach, Gerry Britton in charge of the youth squads and behind the scenes as general manager, Ian Maxwell too. It feels like the people running the team are part of its history and dedicated to its future. 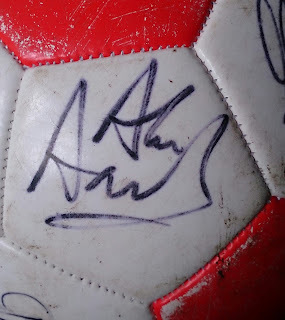 Archie signed my ball, I'll never wash it! Everyone talks about their football team as if they are an integral part of it, it's always "We was robbed", never "they". In Glasgow the majority blindly follow the Old Firm. Partick Thistle used to sell themselves as the "great Glasgow alternative", hinting that we were above the sectarian bile that used to be a lot nearer the surface in Scottish football. I was not yet a year old when Partick Thistle won the League Cup in 1971, so can't claim to have been there. We lived in Maryhill until I was 11 years old so my earliest visits were with my parents in the late 1970s when Bertie Auld was in charge. Although nobody in my immediate family had any great football allegiances we'd go along to support our local team. We would also go to Maryhill Juniors or to Firhill for reserve games, I can remember on one occasion my mum laying out a picnic in the north terrace behind the goal - don't let anyone tell you that the terraces were packed week in, week out. 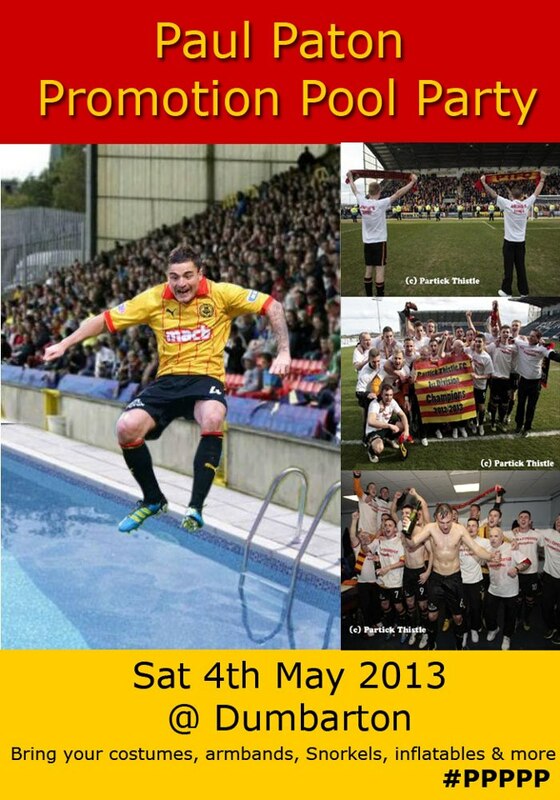 When we moved away to Knightswood I'd still go to Firhill with my brother and a couple of friends. Most people followed Rangers or Celtic at school but there were also more Dundee Utd and Aberdeen fans in my class than Jags fans - teenagers like to follow winners. In those days we used to stand behind the goal at the south terracing. This let you harangue the players or ref as they left the pitch to head into the tunnel or spend 45 minutes shouting "scab" when John Martin was playing for Airdrie. Occasionally we'd venture into the Shed, where the fence down the middle separated you from the opposition, but wasn't impermeable to globs of spit or the odd pie heaved over. Running battles down Maryhill Road weren't uncommon after those games, with a few hurled half-bricks dodged by those heading home. There were other brighter moments which just seemed to sum up what felt good and slightly daft about Partick Thistle such as the match against Aberdeen when one man with a broom wasn't able to clear the pitch of snow with us 2-0 down, particularly as his broom snapped in the attempt (we lost the replay 7-0). The club was in financial decline and in 1998 only the fan based "Save The Jags" campaign prevented bankruptcy. I was going to more games than ever then, although I can't remember the football being pretty. As we slumped to 8th place in the second division I kept going regularly despite, for a period of about 2 years, not once catching a Thistle victory home or away. That changed with consecutive promotions under John Lambie in 2000-01 and 2001-02. 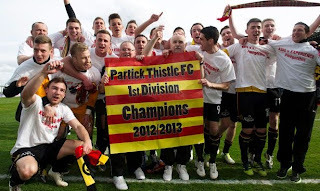 It was fun to be a Thistle supporter again and I loved the away days to Arbroath and East Fife and the like. A 2002 League Cup quarter-final at Parkhead sticks in the memory as a typically frustrating game from those days. After Paul Lambert's goal put Celtic ahead, Alex Burns equalised and took us to extra time and penalties only for BMMMH (now of Morton of course) to miss the one that let Celtic through. A few more relegations and promotions lay ahead. Under Ian McCall we achieved a level of stability and got to watch the likes of Gary Harkins play, but ground out results and were stuck in First Division limbo. Some young players who joined at that time have progressed to become excellent first team regulars. We may make a virtue out of a financial necessity, but surely this is the only way forward for Scottish football, finding young players with potential and allowing them a football framework that lets them play and progress. Stuart Bannigan joined Thistle as a boy about 6 years ago and this season has become a first team regular and appeared in the Scotland U-21 team. Although Jackie McNamara and Simon Donnelly only took us to 6th place last year in the First Division, the way we were playing appealed to my inner football hipster. We were better on good pitches, struggled with a Firhill pitch churned up by the Warriors rugby team, but were passing and moving and on their day, good to watch. This season looked promising even by the time the pre-season friendlies had kicked off. I always enjoy these, you know the results don't really matter and you can sit back and watch, try to see the season's likely set up take shape. This year's games with a Celtic and an Everton XI promised passing football was planned, and provided victories too. Newly relegated Dunfermline and Pressley's Falkirk were most pundits' tips for promotion, but by the end of August we'd already beaten them both. The early season Challenge Cup game against Queens Park at Hampden brought a good crowd and a battling 5-4 victory which showed that this group of players had a bit of determination too. Were we in with a chance at last? Goals were going in left, right and centre. A 3-1 defeat by Morton in October was soon forgotten with a 7-0 gubbing of old rivals Airdrie and beating Dunfermline again, 5-1. More than this was the feeling that when we got our noses in front and the confidence was up, we looked like "we score when we want" as the cry went. We were patient, playing good passing football, with beautiful, fast counter-attacking goals. The away form was shakey and discipline and red cards were at times costly, so when Dundee Utd took Jackie MacNamara heads could have gone down. But the opposite happened. "Right, we'll bloody show you" was the feeling you got from the squad. Archie was happy to drop to the touchline and a solid back line was taking shape in front of the ever reliable Scott Fox. There were options throughout the rest of the squad with competition for places. Christie Elliot and James Craigen appeared to have come on noticeably during their earlier, lower league loan spells. But the endless succession of mid-week and weekend games seemed to be taking its toll. Losing away to Cowdenbeath, Thistle were saved by the Fife fog as the match had to be abandoned. In the re-arranged match, unlike the game with Aberdeen I mentioned above, we did decisively reverse the earlier showing, winning 3-0. The Challenge Cup final in Livingston in April was a great day out spoiled by the football. Whether it was nerves, fatigue, whatever - Thistle never clicked that day. There was drama aplenty with last minute penalties, red cards and equalisers but it was Queen of the South who won on penalties. 1-1 and losing on a missed Thistle penalty - we'd seen this before at Parkhead 11 years ago (see above). So I was fearful that three days later we had to face Morton. The extra time, the hole punched in our defence by Aaron Muirhead's red card, the mental exhaustion from defeat and the recent busy schedule of games - would it start to catch up with Thistle facing the old, experienced hands of Morton next? #WeGotThis was the message that the players were calmly sending out. Suddenly Archie's decision to pick up two experienced defenders discarded by the sinking Dunfermline made a lot more sense than I thought it did initially. Andy Dowie stepped into the middle of the back line and almost 9000 people turned up to see Thistle beat Morton 1-0 in the unofficial title decider. The most surprising thing for me was that at no point did they look like losing. The final point to mathematically clinch it came against Falkirk last week, so this Saturday we can relax, have a wee party and pick up a trophy when Dunfermline visit. As you would expect other teams have noticed and we've already lost Chris Erskine and Paul Paton for next season to Dundee United. It's no fair, but it happens. The management now need to sit down and re-build a squad for the SPL, but as plenty of cup games have demonstrated this season, the gap in quality between the top two leagues ain't what it used to be. Also we've still got Paul Paton's Promotion Pool Party he promised us before the season is officially wound up and we worry about that. Many of the players thanked the behind the scenes people that keep the club ticking over. It is not a big operation and everyone involved knows there are other people keeping it going, from physios to stewards, First Aiders, volunteers selling programmes, organising events and raising money. Local MSP Sandra White's parliamentary motion to congratulate Partick Thistle on their victory is a bit of cheesy politicking, playing to the audience, but it sums it up nicely. 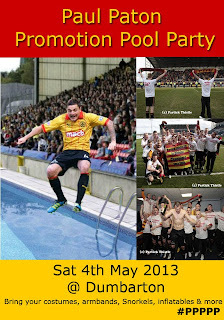 "That the Parliament congratulates Partick Thistle FC on being crowned Irn-Bru Scottish Football League First Division Champions for season 2012-13; applauds first team manager Alan Archibald for steering the team to the championship, which it considers to be a feat of some magnitude considering the financial restrictions on the club and reliance on young players and home-grown talent; notes what it sees as the excellent community work that the club participates in throughout Maryhill and across Glasgow via the club and supporters' collaborative efforts through One Thistle, and wishes all those at the club continuing success in the future." Anyway, we are going to enjoy the moment. It has been a pleasure this year to have gone along for the ride. For a lot of this season I've been disinterestedly oblivious to the goings on of Rangers and Celtic (if only the media were). Definitely in the past few weeks I've felt like there's only one team in Glasgow. That is priceless.